You are writing a book...or you have one already published and the OMG moment hits. You have made a mistake (or maybe a lot of them)...screwed up...or you may feel clueless about the tsunami of items you need to deal with. You do not want to fall further into the abyss of book creation and publishing. You need help and savvy guidance. 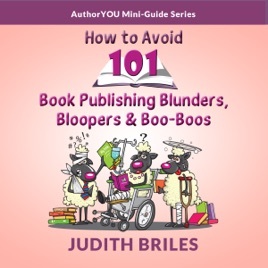 How to Avoid 101 Book Publishing Blunders, Bloopers and Boo-Boos reveals 101 strategies and tips to ensure your publishing success. Create design elements that keep readers coming back for more. Identify readability factors to ensure your reader ease and aha take-aways. Determine who the publishing predators are and how to avoid their traps. Pinpoint the essentials that every successful author must include in a book. Get hot tips for creating and maintaining momentum in book marketing. Structure social media that is ideal for your book and expertise. Learn what to avoid in contracts and how to end them if necessary. Finally, here is the guide authors and writers have been looking for. It is easy and understandable - one that shows you how to avoid the potholes that litter the publishing maze.